Breaking with 80 years of ecological theory, scientists at the University of Minnesota and the Universities of Guelph and British Columbia have found that the best way to spot a sustainable relationship between social predators and prey is to count not the animals, but the groups they form. The study may help explain the rise of humans -- the most social predator -- and suggests the need to curb activities that break up animals' social structure. The work appears in the October 25 issue of Nature. "The juncture between two fields of study--in this case, social behavior and predator-prey theory--often yields the most interesting findings," said Robert Sterner, director of the National Science Foundation (NSF)'s division of environmental biology, which funded the research. "A realistic appraisal of long-term dynamics and sustainability often requires in-depth biological knowledge, as this study shows." Ecologists have been puzzled for decades over the stability of predator-prey relations, said ecologist Craig Packer of the University of Minnesota, a co-author of the paper. "Traditional ecological models have erroneously predicted that predators would inevitably over-exploit their prey, leading to frequent population crashes. But most highly vulnerable prey species form herds, swarms, schools or flocks, and group living reduces predators' efficiency to the point where co-existence is likely to be the rule rather than the exception." Packer said that while sociality in early humans and in their prey might have allowed long periods of co-existence, we eventually became such extraordinarily efficient hunters that herd formation could no longer protect our prey from mass extinction during the great die-offs in North America and Europe around 12,000 years ago. "This result is remarkable in light of the intense scrutiny that predator-prey relationships have received in ecology," said Saran Twombly, program director in NSF's division of environmental biology. "The finding is likely to have broad implications for diverse types of interactions and their effects on community or ecosystem stability." Ecologists have long modeled interactions between predators and prey by taking head counts of each species and assuming that individuals are evenly dispersed over a featureless landscape, ignoring the fact that many predators and their prey both form social groups. But the number and distribution of groups, rather than individuals, is most important in determining how often -- and for how much longer -- the two species will interact, the researchers found. "The greater the tendency to form groups, the higher the stability of numbers of both species over time," said John Fryxell, an integrative biologist at the University of Guelph, and first author of the paper. "People hadn't appreciated the degree to which group formation has implications. This work shows that perhaps we should take a closer accounting of grouping patterns." 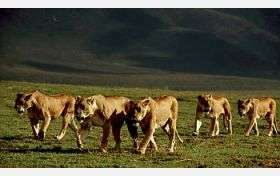 The researchers used data on lions and wildebeest in Africa's Serengeti Plain, drawing on four decades of observations on lion behavior and censuses by Packer; data on lion hunting behavior and success by David Scheel of Alaska Pacific University; and their own censuses of wildebeest and other herbivore herds in the same area. The finding implies that even if an ecosystem has lots of carnivores and their herbivores, the two populations may be in trouble if the animals are social but cannot readily form groups. The results have implications for managing large ecosystems like the Serengeti or North American national parks. Fryxell said that, for example, managers of South African national parks sometimes bore holes to create watering spots for animals, an activity that spreads wildlife out and may keep them from grouping. Road-building or disruptions by tourists may do the same. "Anything that tends to fragment aggregates of animals could work against the protections that group formation provides and against the stability of the whole food web," he said. Fryxell, Packer, and co-authors Anna Mosser (University of Minnesota) and Anthony Sinclair (University of British Columbia) are charting a plan to extend their observations to describe the entire food web of the Serengeti.